The Gila Monster is the largest land lizards in the United States and it’s native to southwestern U.S. and northwestern Mexico, where they can be found in desert and semiarid areas, under the rocks, in burrows and holes. These lizards can grow up to about 60 centemetres (2 feet) in length and weigh around 2.3 kilograms. As a result, they’re quite massive and slow-moving and they’re quit passive, spending most of their time in the burrows or holes they have dug, emerging only to feed and mate. The Gila Monster has earned it’s name for being one of the few venomous lizards in the world. 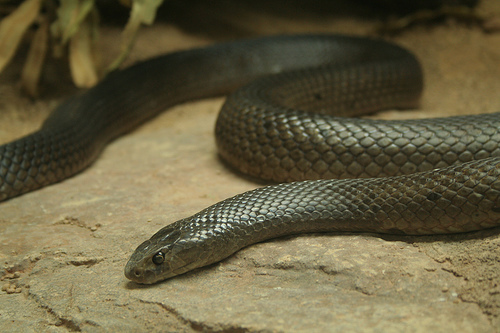 It’s venom is a fairly mild neurotoxin, that is produced in the lizard’s body in quite low amounts. 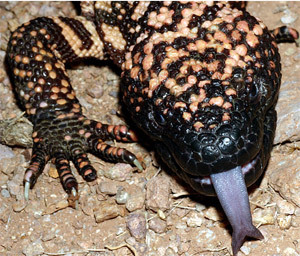 The Gila Monster also lacks the musculature that injects the venom, so the dose is delivered by chewing the prey. Therefore, there have been no cases of human death, although the bite is said to be extremely painful. Basically, if you don’t let the lizard chew on you for a few minutes, the venom will probably have little effect. In any case, these lizards, due to their sluggish nature don’t actually pose a threat to humans and would rather avoid any confrontation. The Gila Monster, during the little time they spend emerged, feeds on mammal babies, eggs, frogs, snakes and other creatures it can get it’s hands on. An interesting fact is that these lizards feed very infrequently – only five to ten times a year in the wild, more in captivity. 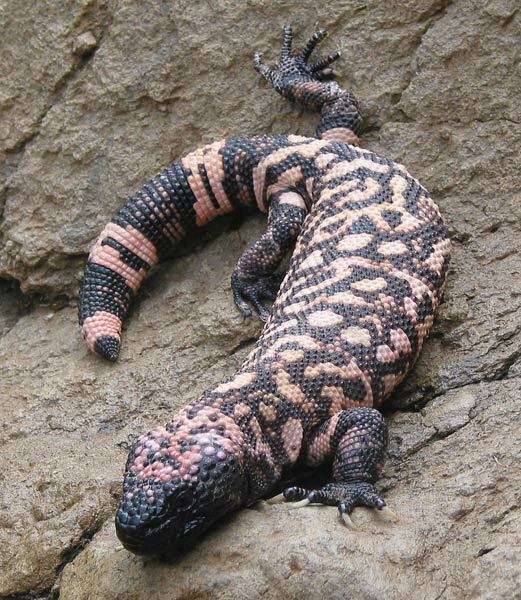 The Gila Monster relies on it’s highly developed sense of smell to find eggs buried in the ground or hidden in nests. Gila Monsters mate during the summer seasons, male lizards often wrestle during this period. 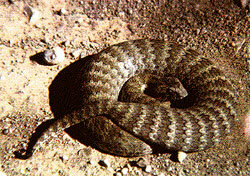 After successful copulation, two to seven eggs are laid in sands, under rocks or in burrows. Hatchlings are able to bite and already have venom upon hatching. They reach sexual maturity at the age of 3 – 5 and they can live up to 20 years in the wild (30 in captivity). Gila Monsters, although quite slow and passive, are rather disliked by hikers and other humans encountering them and are often killed, although they pose little actual threat to humans. Currently the number of Gila Monsters is shrinking, due to destruction of their natural habitat, as well as poaching. Gila Monsters are considered a threatened species. As of now, hunting, trade or any other action that may harm the population of Gila Monsters is prohibited by law. They are a often bred in captivity in zoos, although no actions have been taken to increase their numbers. These lizards, although quite sluggish, have been a subject to many myths based on prejudice and the attitude towards them is a lot more negative than they deserve.